The increasing number of student loan debt is a big concern for future and current college students. Democratic presidential candidate, Bernie Sanders has an elaborate plan on how to tackle this issue. If Sanders is elected as the 45th president of the United States, he plans to make every four-year public college or university, tuition free. The candidate calls this the College for All Act. Sanders has a huge platform for his campaign, he plans on to tackle on many problems that America’s currently facing, overpriced college being one of them. This proposal may be one of the biggest and most important for many people who desires a higher education. Sanders would make an exceptional president with this proposal he is attempting to pass. Tuition- free school means that students would no longer have to give a college an arm and a leg. It would also allow anyone, no matter what social class to get a higher education. As a college student that comes from a low-income family, I’m on board with the College For All Act. I agree with Bernie on this cause of action. As a student who is in the working class bracket of the social class, I can highly benefit from this proposal. Students will no longer have to graduate with heavy debt on their shoulders. I believe more people would attend college if tuition was free, and student loan rates would be more manageable for a college graduate. As a college student myself, I can benefit from the College for All Act. Sanders isn’t only making public colleges and universities tuition free, but he’s expanding the Federal Pell Grant, chopping student interest rates in half, and expanding work-study programs. This legislation, along with other beliefs that Bernie has makes him the ideal president of America. He’s worried about all of the right things, and actually has a plan on how to handle and fix what’s wrong with America’s higher education system. What he plans to do is get the government to fund seventy billion dollars into this legislation. He also plans to impose a financial tax on Wall Street to help with the free tuition bill, which is a smart thing to do. Bernie’s method of this bill is impeccable because brokers on Wall Street invest in many companies along with subsidiaries, it’s amazing that they would invest in free college education. Making more than 70k yearly, Wall Street would be a great help to the higher education system. Numerous countries in Europe offer free higher education for anyone who wants to attend college. Norway, Germany and Sweden provide tuition free college. Norway pays for free tuition with taxpayer’s revenue, and Sweden’s universities didn’t have tuition fees until 2010. Bernie’s sort of following in Norway’s footsteps when it comes to free tuition. As Norway utilized taxpayer’s money, Bernie plans to tax the workers of Wall Street, along with the government to assist with his free college proposal. Current and future college students who can’t afford to pay a hefty amount of student loans after graduation should really take this bill into consideration. 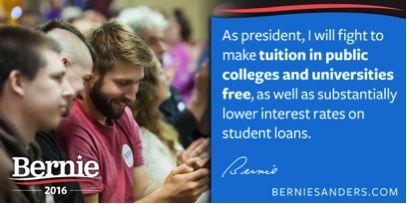 If Bernie Sanders does become president, the interest on my student loans would be cut in half. Also future college students would get a higher education without the burden of student loans. It’s imperative for current and future college students to be active in this campaign. Without the input of individuals who attend college and are facing this problem firsthand, it would mean nothing to the higher education system.